When creating package design, keep in mind that although you want the package to be unique, you must consider function as well as form. Are you trying to protect fragile components, keep small pieces from moving freely inside, or do you need to develop packaging that allows for the flow of air throughout the container? So, the first step is to determine how your packaging is to be utilized. In addition, consider how the items will be stacked for shipping, and how they will be displayed in a retail setting. There are several elements that can be utilized to achieve a packaging solution that will make an impact. The proper use of color, shape and texture can make a product stand out from the rest. 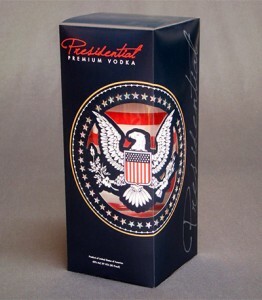 A good example of these essential design components is seen in this “Presidential Vodka” box. The logo wraps around the corner of the box creating visual interest from 2 sides. A laser cutter was used to add an innovative three-dimensional quality, allowing you to see through the packaging to the product inside. The elegant use of the presidential seal conveys the message that this is a superior product. In this way, branding and packaging are combined to effectively contain and display a product, creating visual interest that will attract consumers. Nearly every package design will require either scoring, folding or cutting your packaging materials and packing components. The most efficient process for accomplishing this would be with a state of the art custom laser cutting system like those available at LaserLogik. Their advanced technology allows for cutting contoured shapes and intricate designs that cannot be achieved with traditional die cutting methods. Never underestimate the importance of a reliable, knowledgeable laser cutting service that can meet all your packaging needs.